Kishore Kumar was a singing legend - a great and renowned Indian music star. Besides his talent, he was known to be a very loving, generous, and passionate human being. However, this post will examine another aspect of his personality which is revealed by some interesting lines on his hand. 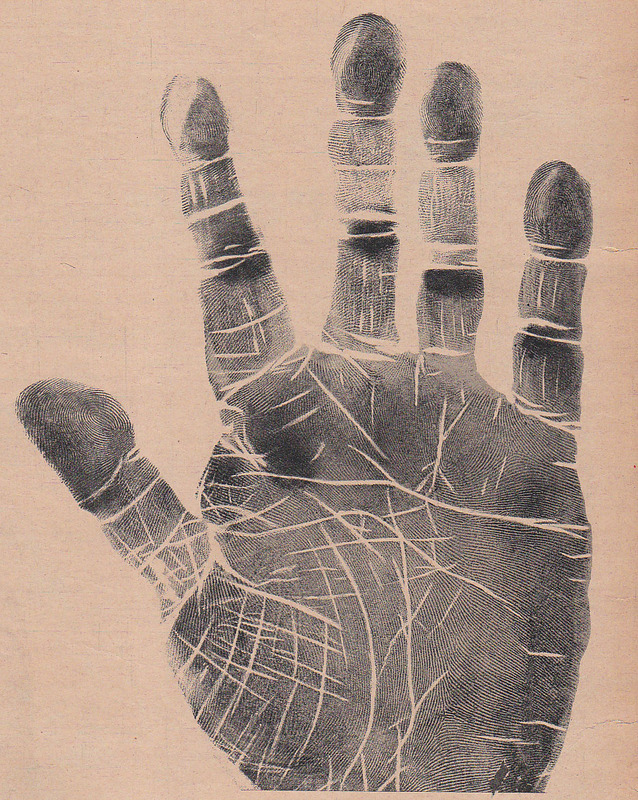 Fascinating from the point of view of Palmistry. While it is well known that he had a turbulent personal life (4 marriages), it is less well known that he was considered a little eccentric as well. (as the ones on KK's hand), it can also show that the thinking was not always logical. On KK's hand, the normal Headline stops mid palm which shows that he was able to function quite normally in the world, more so in the younger days. Another Headline overlaps it. It appears to be originating from lower mars (which is well developed) and the origin as well as the shape of this line is unusual. It's distinctly wavy. This second Headline shows a high level of aggression, a person who could get antagonistic, at times with little provocation. This aggression is expressed because of the energy and drive shown on his hand with the broad/large palm, and the strong, deep lines, and the well-developed Lower Mars. Just the Headline itself will not show this. He had a strong personality. This second Headline also shows materialistic ambitions (which reduce as he becomes older). There is also the strong downward branch of the Heartline. It dips down and enters the Lower Mars area. Not a good sign when it comes to love relationships. While the deeply etched and branched Heartline and the developed Venus Mount shows a person with pronounced passions capable of deep love, helpful and warm, it also shows someone with a controlling nature. This could cause some difficulty in intimate relationships. His hand busts the prevailing myth that the lines under the Mercury (little) finger, the so-called Marriage Lines, show marriage/relationships. There is only one short line on his hand under the Mercury finger. However, Kishore Kumar married four times, and two of his marriages ended in divorce (singer Ruma Ghosh and actor Yogeeta Bali), one ended by the death of his wife (Madhubala), and his last marriage to Leena Chandavarkar lasted for about 7 years, till his death. And it’s not as if the marriages were short or insignificant. His first marriage (Ruma) lasted 8 years, the second one (Madhubala) 9 years, and his last marriage (Leena) about seven years. Only his marriage to Yogeeta Bali (third wife) can be considered a short one – about 2-3 years. Kishore Kumar died at the age of 58 but his lifeline is strong, deep and goes right around the mount. As the Lifeline does not show death, where is his death marked? Death can be marked anywhere in the hand, on any of the lines or on the palm which is why it is very difficult to predict death. In KK's case, it is marked by the dark cutting line across the Line of Fate, under Saturn, around the same age that he died. Such a line (as dark and deep as the main lines) crossing the Mount of Saturn, does not usually show death, although it always does show an unfortunate event. Kishore Kumar was a famous Indian film playback singer, actor, lyricist, composer, producer, writer and director. You might also like to read Death and Hand reading or The Myth of the Marriage Lines. Or browse through the posts on international "Music Stars" for hand readings of international music celebs ranging from Michael Jackson to Kurt Cobain. If hand-lines change based on our actions, thoughts and activities, how would it even be possible to try to predict death? DI, I am a palmist and that is why I see hands. :) Seeing hands of eccentric people is a learning experience. Also, eccentricity can mean many things, and is too vague a term. The hand shows a clearer picture. However, a person who has had 4 marriages is not necessarily eccentric. He can also be fickle, impressionable, or simply just a heartless person! The reason for the breakups is something different in Kishore Kumar's case. It is not the traits mentioned above and nothing to do with the eccentricity. When it comes to eccentricity, it is others who believe a person to be eccentric but he might not think so. The hand explains why he behaved the way he did. It was the illogical conclusions that he would come to which led him to behave in some odd ways. Not because he was mean. Mahesh, please write to me on my email address. It is given on the right hand sidebar, under my profile. Thanks. Dear Agiie, my email id is given on the right hand side column, under the About Me section. @ nita . I have seen palms of honey singh in different photos , his fate line is short and faint , he don't have any sun line either apollo mount isn't that much developed still he's very famous and successful . apollo mount and sun line do not show fame. i have seen taxi drivers and maid servants with good sunlines. It is the same with fatelines. the hand has to be read as a whole. That said, you cannot assume that he has a short fateline or no sunline unless you see a high resolution photo of his hand. I can see his fateline almost till the mid thirties and it is likely to be present in some form even after that. we don't know. I cannot publish your comment here because this is my website and I do not want to mislead my readers. Palmistry is a field where there are many interpretations of the hand and this website has my own personal interpretation. As long as your comment is polite and respectful I will publish your views. If it becomes rude, you are not welcome here. 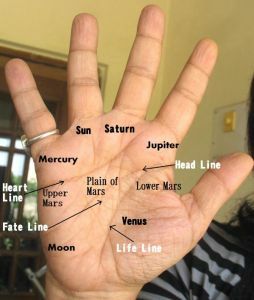 Your blog is really informative and i really like the way you are treating palmistry as a science which can have any outcome, positive, negative or even neutral. :-). And most importantly you always emphasize a Hand to be taken as a whole package rather than commenting in bits and pieces. The cross you mentioned which marks KK's death under Mount of Saturn, Is this the one between Heart and Head Line just before the Fate Line ends ? If yes is'nt that age before 50 ? Please shed some light on these questions when you have time. Regarding KK's death, I have not mentioned a cross on his hand. Just a crossing line and it does not form a cross at all as the fateline is missing at that point (in any case any lines crossing the fateline cannot be considered a cross but just a crossing line or bar). The bar is much higher up, and not between the head and heart lines. Regarding the sunline there are a lot of misconceptions about the sunline. It is commonly believed that the sunline shows fame. It does not. Interesting, now i got the Line which you mentioned. I was confused as your analysis said :'dark cutting line across the Line of fate' although the Line of Fate is missing at that point as you pointed out. I feel it takes lot of expertise to point that line and relate to a person's Death. Regarding Sunline, i totally agree that this line is misunderstood. However, when you see on the Apollo Mount this strange Sun line from broken pieces form a strange yet strong shape, Does this mean something ? Ankur, all lines have meaning, and whether major or minor depends on their strength in relation to the hand. Also, KK's hand does have a lot of lines. I am not sure of your question though. But if a sun line is present strongly only on the mount it has less significance. A sun line also shows personality characteristics. Broken lines have less meaning. Maam can I publish my hand images.. If so please give me ur mail id..
My email id is on the right hand column. Please write to me and I will reply to you with the hand reading charges for different types of readings. Once you select a reading I will give you instructions on the type of photos to send. Please do not send photos unless they are according to the instructions. Thanks. Dear Pallavi, you are falling prey to the superstitious aspect of hand reading. Your partner's death cannot be seen on your hand. Why, it cannot also be seen on his own hand! So please stop your worries. Secondly, it is very unusual for the marriage line to touch the heartline. I highly doubt that it is so. Thirdly, the left hand shows the past or subconscious so it is not at all relevant to the future. Therefore you are worrying for no reason. Please ask yourself what it is about you that makes you worry like this for no reason except reading some misleading things on the internet. As regards moles, these are caused by skin conditions. It has nothing to do with death. If you are believing such nonsense, really, I cannot help you. Thanks for dispelling the myth that union lines show number of marriages. An interesting point to note is that Idi Amin whose palm you also read in a separate article, had 5 marriages but he has only one union line. Regarding the double head line. Cheiro said it is a mark of advanced mentality and coupled with a good mount of Jupiter a person can become a self-made wealthy man. Ironically, he himself also had a double head line so I also wondered whether or not he was specifically referring to his own success. As you stated above, KK's head line from lower mars fueled his aggressiveness and might have contributed to him being an eccentric in terms of other people's opinions. Similarly, Michael Jackson also had a double head line and he is also considered an eccentric by many people. So what does a double head line on an otherwise good palm show? And what do most palm readers mean when they say advanced mentality? Does it mean increased levels of natural intelligience or smartness in making money? And on a bad palm does a double head line denote mental confusion? One has to carefully see the type of headlines, the quality and placement. If both headlines are good, then it means more capability and if the hand shows it, more intelligence. Whether such a person can make money or not depends on the type of headline. If both headlines are good, such people are naturally more successful. On a bad palm a double headline does not show mental confusion at all. On a bad palm a double headline can negate the effects of it. It depends on the headline. If the headline itself is bad then it can show even insanity, mental confusion. This can be seen with even one headline. Even though you probably know it, I want to remind you that that lines do make the person. The lines reflect who we are and not the other way around. Also, the traits of aggressiveness and irritability are not related to the eccentricity. Eccentricity is often caused by minor behaviours and mannerisms which are often not seen on the hand. People who do not follow social norms are often deemed eccentric. MJ was reclusive and a private person and that is probably why he was considered eccentric. Thank you Nita for explaining the concept of double head lines so clearly.